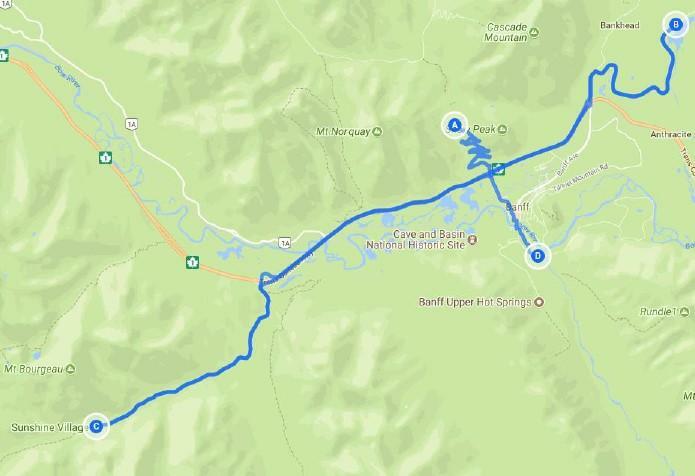 If you're looking for a short driving tour with plenty of amazing scenery, join us as we visit Sunshine Village, a world-famous ski resort that opens in the summer for visitors to enjoy the alpine environment. The total driving time for this tour is 1 1/2 hours. Our tour begins by driving through a valley passing Lake Minnewanka and a 20-minute stop to admire the pristine waters of Two Jack Lake. After taking it in, our drive continues to the base station at Sunshine Village. We’ll board the Scenic Alpine Shuttle at a starting elevation of 1,660 meters (5,500 feet) and continue skyward for an up-close experience to the village at 2,164 meters (7,000 feet). From the Village, ride the Standish Quad Chairlift to over 2,400 meters (7,875 feet) experiencing 360-degree views of the Rocky Mountains surrounding you. Want more? Catch even more breathtaking scenery from the Standish viewpoint platform and take in the view of the three high alpine lakes: Laryx, Grizzly and Rock Isle. Next, we enjoy an easy 45-minute walking tour. Get the full experience of the Canadian Rockies as our Trail Hosts provide insights into the surrounding mountains, wildlife, and history of this UNESCO World Heritage Site. Walk the flower-filled trails of Sunshine Meadows as they wind their way past waterfalls and lakes. On this tour, you'll learn all about the fascinating world above the tree line. After the tour, take the chairlift back to the Village for Lunch in the Sky in the main Lodge. We'll enjoy the buffet in a private loft with amazing views. There is plenty of time for a leisurely lunch and to roam the village while soaking in the views before returning to Banff.